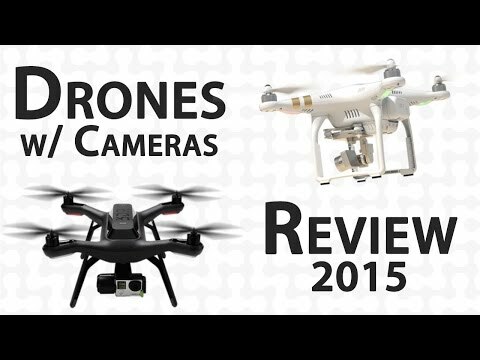 The Best Drones with Cameras is the focus of this review. One of the BIG things among media, entertainment and technology enthusiasts and professionals is Drones, camera stabilizers and Sliders. It’s no secret that video is booming NOW, more than ever before. The times are finally catching up with the capabilities, and the capabilities NOW, are almost unbelievable. Let’s start of with drones. The term Drones is popular now. We are most familiar with them from news reports of their use within a military context. Drones are really Unmanned Aircraft Systems. Sometimes, these are commonly referred to as UAS, or UAV for Unmanned Aerial Vehicle. You can also think of them as remote controlled helicopters or RC Helicopters. Outside of a military application, these unmanned aerial vehicles are most often used for other purposes like agriculture and Aerial Videography. The agricultural industry is being revolutionized by drones in such areas as soil and field analysis, crop dusting, crop monitoring, and irrigation. Some of the leading experts in the aerial videography business are quite knowledgeable and experienced in the use of drones. They can be quite helpful in explaining a lot about safety considerations, maintaining your drone, the do’s and don’ts on the legal side, etc. These include professionals, some of whom are pioneers working with major networks using their aerial video services. The FAA has increased its granting of Section 333 petitioners. Before this increase in 2015, only 20 companies had been approved to fly drones for commercial video use. You can click go to the FAA page on Section 333 for more information. Scroll to the bottom to see current exemption requests from shooters and media companies, and, authorizations granted under the Section 333 exemption. They even give instructions for filing an exemption request. I encourage anyone wanting to buy a drone, or has actually bought a drone, and wants to make money shooting aerial video for their customers legally, to read-up on the FAA.gov website. The Best Drones with Cameras reviewed here and in the featured Youtube video are in the sub-$2000 price range. First is the Typhoon Q500+ 4K quadcopter. This drone has a built in No-Distortion 4K camera on a 3-axis gimbal, a 5 and a half-inch touch-screen remote, or ground station, plus the ability to view on your smart phone. These features make it one of the best drones with cameras on the market. It actually has auto-landing, a follow-me feature and a ton of intelligent technology built-in to make flying a breeze. The Typhoon Q500+ PRO includes their Steady-Grip, that allows you to use the camera and gimbal on the ground. It’s shaped like a gun and looks pretty cool if you want to try some steady shots while walking. You’re better off getting it right here at Amazon for a very reasonable price. The next 2 best Drones with Cameras can be counted as 1 since they’re both made by DJI.That company is leading the pack in affordable drones. Some of the issues for consideration with Diji include their limitations for replacement parts and what some consider as poor customer service. It may be a consideration if one of your motors goes out, you update the firmware and your drone becomes useless, or you just need to talk to someone who cares about helping you. All of this chatter can be seen on the DJI website forum. It’s best if you personally call DJI yourself, so you can make an educated judgement for what it’s worth. DJI is definitely a dominant player in the industry. It sounds like they have temporarily won the popularity contest for the past 3 years, but others are on their tail. The DJI Phantom-3 Advanced Quadcopter with built in 1080 HD camera, and the DJI Phantom-3 Professional Quadcopter with 4K cameras. Both look pretty much the same with the 4K camera being the differentiator. They both use the DJI Pilot app for your Android or iOS smart phones that snap onto the controller for viewing what your camera sees, GPS navigation, auto take-off and landing, gimbal stabilizer, and also, a lot of technology and features that look pretty impressive. You can find them on Amazon. The 3DR Solo is up these among the list of best drones with cameras. “The first drone with a brain” is their first bullet of descriptive features on the 3Drobotics Store web page. These guys are taking a completely different approach compared their competition. The Solo is powered by twin computers. It is the Only drone to stream live HD video from a GoPro direct to your smart phone. The 3DR Solo also has some pretty unique safety features. Safety comes FIRST! This drone also has In-flight GoPro Access: with Start/stop recording and adjusting the camera settings from the ground. That’s helpful! The remote control, or “ground control to Major Tom” is built like a video game controller, with user friendly buttons like FLY, pause, Home, and A/B buttons for presets just like the old Nintendo controller! The folks at 3DR are really focusing on the future. They have designed the Solo with upgrades and add-ons in mind. Sending your drone back for a motor repair, or having to buy a whole brand-new drone in a year or 2 to get all the latest goodies is not t. It’s good to see companies like 3DR thinking about things that make flying easy and safe first. Their partnering with an innovative camera giant like Go-Pro helps to establish the 3DR Solo as among the best drones with cameras. In summary, the Typhoon Q500, Phantom 3’s, and the 3DR Solo are definitely worth checking out, if you’re in the market for one of the Best Drones with Cameras. Not covered in this review are a number of other top performers like the DJI Inspire 1. That’s one of the more expensive ones, but worth the salt if you’re seriously looking for long term quality.